Late last night, North Korea said it successfully tested a hydrogen bomb, triggering a mini, human-made earthquake near the test site and causing the UN Security Council to call an emergency meeting. Hydrogen bombs are even more destructive than atomic bombs, so it’s very scary—but experts think North Korea’s bluffing. How can we make sure? Nuclear debris-sniffing airplanes, duh. The aircraft pictured above is a WC-135W Constant Phoenix—also known as a “sniffer plane.” Its task? Fly across the Pacific to the Korean Peninsula and search for nuclear particulate in the air. Doing so could confirm (or debunk) North Korea’s hefty, terrifying claims once and for all. Never heard of sniffer planes? Their history traces back to the first and only country to use nuclear bombs as weapons, just a couple years after the attacks on Japan: post-World War II America. After the war in 1947, General Dwight Eisenhower tasked the Air Force (then known as the “Army Air Forces”) to track any atomic explosions across the globe, to keep tabs on which countries are pursuing the deadly technology. They started using aircraft called sniffer planes, and just two years later, in September 1949, one on patrol between Alaska and Japan picked up nuclear debris left behind after Russia’s first atomic bomb test. Even scarier? At the time, it wasn’t expected that Russia could achieve a nuclear weapon until at least the mid ’50s. You can see how sniffer planes became important, fast. 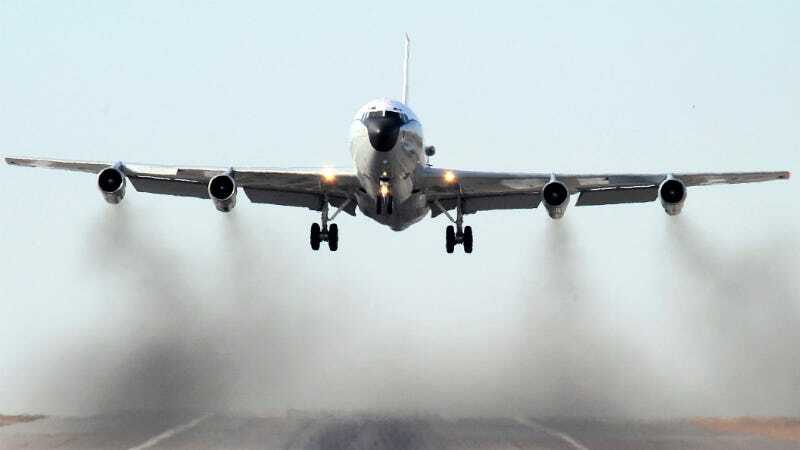 And so began the US Air Force’s “atmospheric collection program.” The planes, which are built to act as a big hazmat suit to protect crew, fly through areas of suspected nuclear activity; they have external devices that catch particulates on filter paper that are later analyzed. In support of the Limited Nuclear Test Ban Treaty of 1963, sniffer planes have continued to routinely to make rounds the world over, from the North and South Poles to East Asia. Sniffer planes were also handy in tracking harmful particulates in the air around Chernobyl following the nuclear fallout in that region in 1986. They were also sent to Japan after 2011’s Tohoku earthquake and tsunami, which led to the Fukushima nuclear crisis. Today, however, the Washington Post reports that the Pentagon confirmed yesterday that a sniffer plane has been dispatched to North Korea—the same country that touts its nukes in front of foreign press in a national parade, and whose technology experts doubt is up to snuff enough to develop a hydrogen bomb. The air samples brought back by the Constant Phoenix will help us determine if this week’s explosion was actually what North Korea state reports say it was. Correction, 5:52 p.m. EST: Dwight Eisenhower was a general in 1947, not president. Correction, 10:13 p.m. EST: Hydrogen bombs are more powerful than atomic bombs. Both are a type of nuclear bomb.